Mashehe Salum is a small scale maize and legume farmer in Ngipa village, Kiteto District in central Tanzania. Four years ago, maize yield from her 4 acre farm was barely enough to feed her family of five. She knew she could get more from her farm, but didn’t know what to do improve her farm productivity. Mashehe’s farm is located in a semi-arid region with low and erratic rainfall. So water access was a significantly big challenge to her farming endeavor. And just like other farmers in Ngipa village, she also planted recycled seeds. Year after year, she would use the broadcasting technique to plant her maize and year after year the result would be the same –poor harvest, not adequate to feed her family. But Mashehe’s story today is a stark contrast to her story 4 years ago. She has become a model farmer for her colleagues after she harvested a whopping 60 bags of maize while her fellow farmers were once again deprived off any significant harvests, thanks to a severe drought that affected Kiteto district last year. According to Mashehe, her life changed the moment she decided to participate in the Africa RISING-NAFAKA-TUBORESHE CHAKULA scaling project’s demonstration farms. 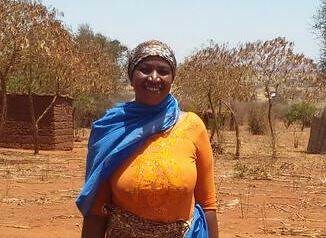 She was one of beneficiaries of a training on climate-smart farming in KIteto District they received trainings various good agronomic practices and soil water conservation strategies in semi-arid areas like Kiteto.